The macaroni I used were thin spaghetti, elbow, and bow tie. Shelly, aka Tachar, from aspot2stamp still has her full mental and humor faculties in tact although she is suffering some horrendous tooth extraction pain. One day we might see a post on the device she is thinking about. Macaroni hot glued to a piece of foam core and used as a stamp. She also saw Butterflies in my experiment that I did not see. 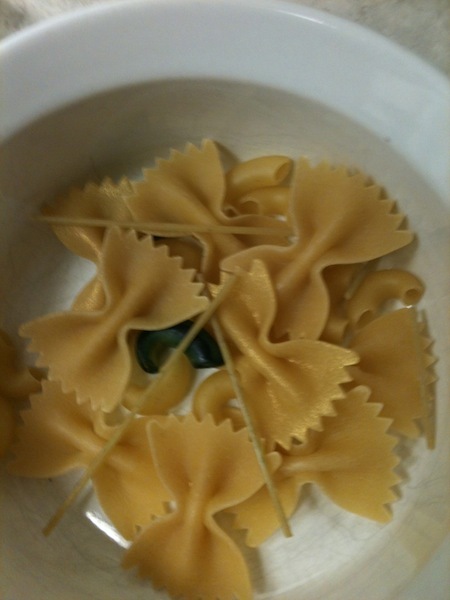 I used the bow tie noodles with several of my home made spritzes on Whisper White card stock. The outline of the bow tie noodle mask is where Shelly saw the butterflies…before I messed with the elbow noodles to make the designs. You can watch the video of my process here. The two pieces I like that came from this experiment are vellum and ink jet photo paper. 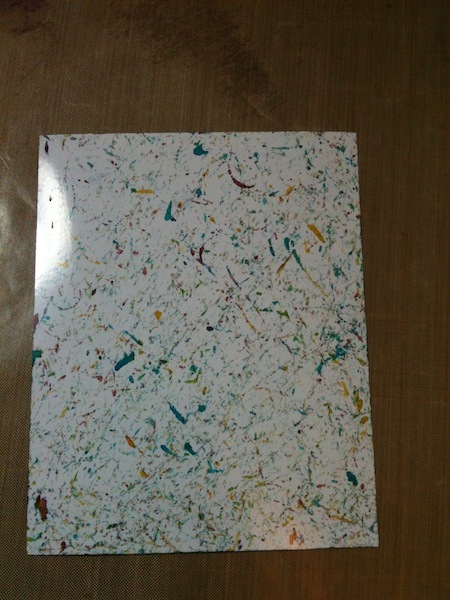 The vellum is a piece I have from Club Scrap. This paper is unlike any other that I’ve used before. Very smooth surface and a thicker paper. Vellum is non porous and does not absorb ink as other papers and card stock does. 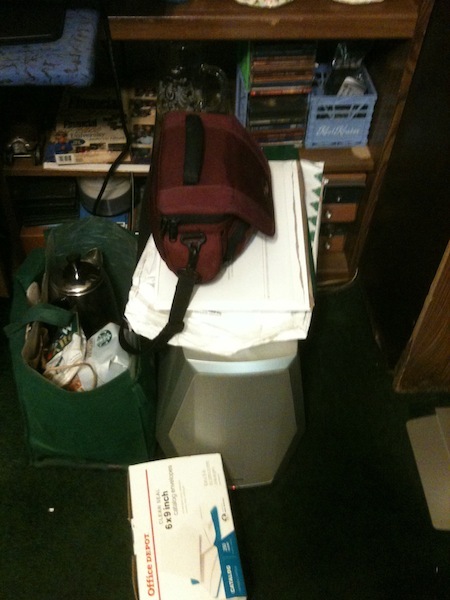 Joe interrupted my experiment a couple days ago to help clean up his stash of items from our porch area. I opted to leave the Faded Jeans Distress ink to dry on its own over night. 18 hours later the ink was still wet in places. 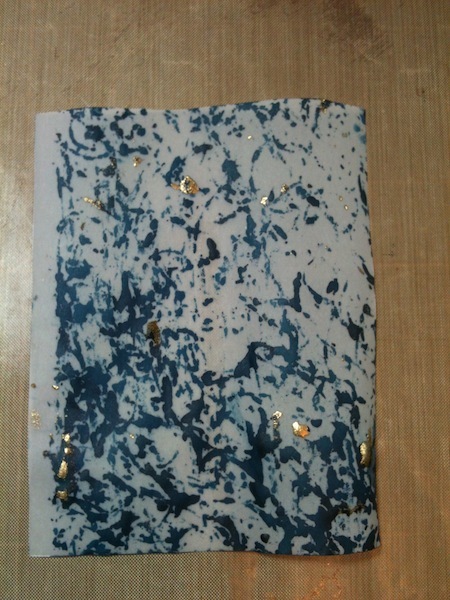 Enough that I poured Gold embossing powder over the entire paper surface and heat set it. I like this piece and will use this technique one again. 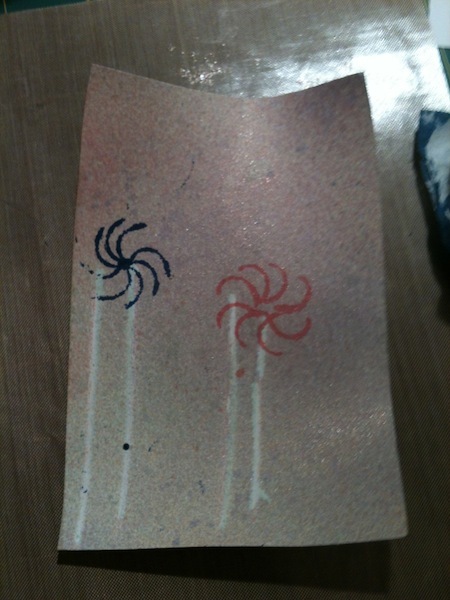 Lastly, I used a piece of Kodak ink jet printer photo paper with alcohol inks. Adirondak Stream, Butterscotch, and Current along with elbow macaroni shaken in a plastic box. I REALLY like this piece and will definitely use this again. It is time to get the suitcase packed and the pickup loaded to head back out for Nashville for our final set of trucks today so I have to get out of this blog and back to work. Seems like Monday to me but it is Thursday. The month of May has some very interesting “National Days” coming up. One of them is “Sandwich Day” in Great Britain. I’m not sure of the exact day in May it is held but I will be making a post from the road about it in my other blog – Foolishness and Mayhem. We delivered our trucks in Wilmer, Texas yesterday. These past couple of weeks have been fraught with so many opportunities. You know, problems in the making to opportunities. I should be posting this to my “Foolishness and Mayhem” blog but I’m going to do it here. Only because I have photos and a video in the works…that is if I can have more than 10 minutes to do them at a time. After delivering our trucks we got a call from our neighbor. The managers of our mobile home park are coming down on all of the residents to clean up their lots. Joe had left a couple of tire carcasses near our porch that needed to be taken to the tire shop we deal with to be disposed of and some pieces of equipment of Joe’s has been neatly stacked and out of the way but has incurred the wrath of the park management. The note said to move it NOW or they would do it for us. So we came straight home from Wilmer to take care of these items. Plus, the water pump Joe had replaced in our pickup two weeks ago has been leaking a little so back to the original shop that fixed it in the first place. Which is also near home. Turns out a hose clamp was faulty when it was installed and the culprit for the leaks. Our porch is cleared off, tires taken to the shop, equipment stored away and we have spiffed up our end. The consensus is the park is up for sale and they want to do curb appeal fixes to put on a good face. Now they spruce the place up – go figure. Okay, enough of that and on to the real stuff I’m wanting to write about. I had mentioned in my “Because I can’t read – Challenge” post using macaroni as a stamp or a mask. I tried it and the results are promising. Needs a little bit of polish and a do over or two but I think this might be something worth looking into later when I have several days to putter around. Spaghetti noodles as masks, and elbow macaroni as flowers. A bit hit and miss but it does work. I laid the spaghetti noodles on a scrap piece of Whisper White card stock then spritzed with my brew. This worked until the paper curled from the wet then the noodles rolled all over the place. Even after I dried the paper with my heat tool. Spaghetti noodles vs. repositionable adhesive. Noodles 1 – repositionable adhesive 0. I then took an Elbow Macaroni, pounced it on a Cameo Coral ink pad to make the “pink” flowers. Then Brilliant Blue for the other flower. One thing I feared was the moisture in the ink would soak into the noodle and then make it mushy. No, that does not happen. The noodle stays dry and firm while the ink does not penetrate into the noodle. NOTE: Cameo Coral, Brilliant Blue, Whisper White are Stampin’ Up! products. The inks may be discontinued – I don’t know. The Whisper White card stock is still available – at least I think it still is. Next experiment in progress got interrupted by an untimely knock on my window with exclamations of needing help outside to get things cleaned up. Which meant that Joe was finally ready to get cracking on the task of cleaning, purging, and putting away his stuff from outside. 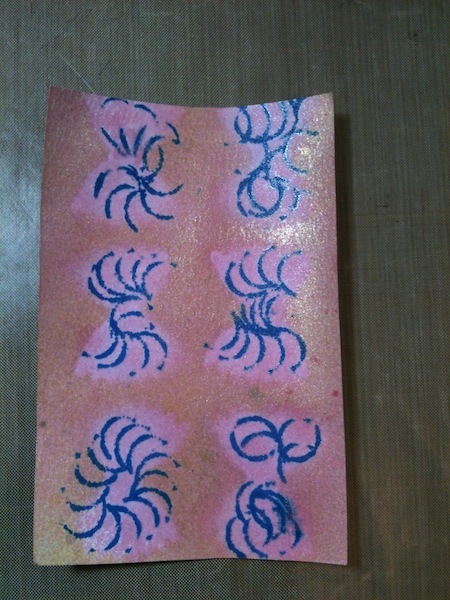 I have a piece of vellum from Club Scrap that I used in a plastic Stampin’ Up! stamp box. 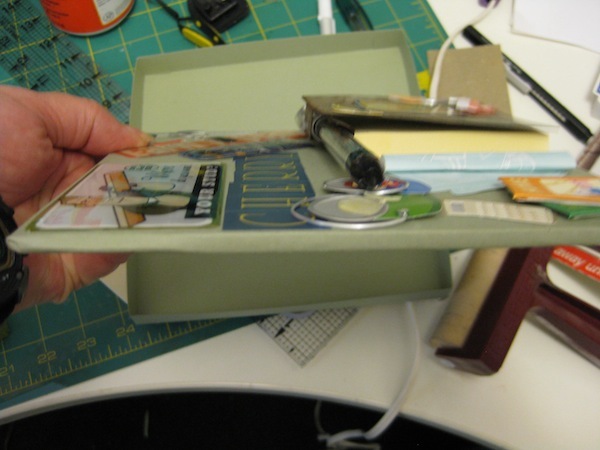 Repositionable tape to hold the paper inside the lid. 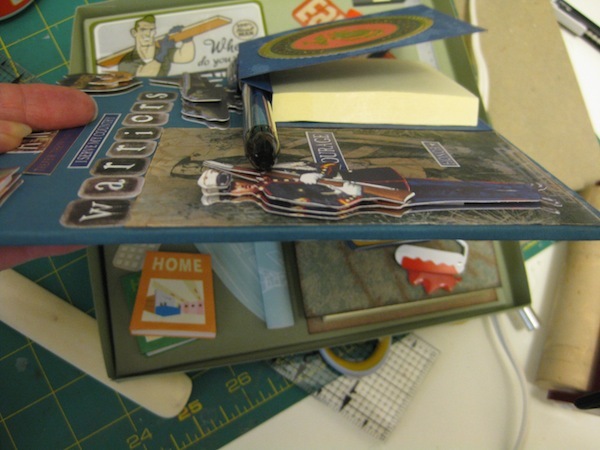 I put several elbow macaroni pieces in the larger bottom of the box and several drops of Faded Jeans Distress Ink (Tim Holtz) in with the macaroni. Give the box a good shake and bouncing racket and the results are…. Six hours later and the ink is still wet on the Vellum. I’m going to leave it over night then see how it turns out tomorrow morning. Vellum is not as porous as card stock is. It is notorious for ink smears, smudges, and all ill manner of whimper inducing bad stuff when not handled properly. Any type of ink application to Vellum REQUIRES administering hot air via the heat tool to set the inks. Liquid ink from the reinker DOES soak into the macaroni. Discolors it to be exact. I’m leaving these bits to dry to hopefully play with them once again tomorrow. 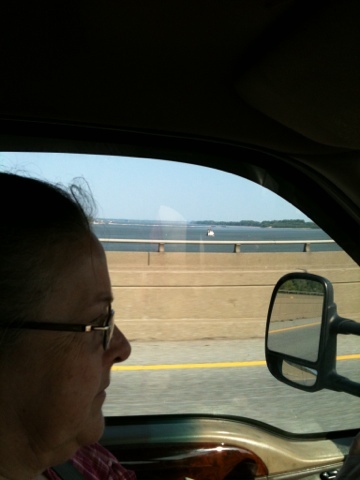 We still have to go back to Nashville for the final set of trucks to be delivered to Wilmer, Texas. However the dealership in Wilmer is not open on the weekend for delivery so we have to plan our driving over the weekend to be able to deliver on Monday. Then it will be back toward home to get trucks from the Port of Catoosa, near Tulsa, Oklahoma to be taken to Las Vegas, Nevada. That is all for next week. I’m only focusing on tomorrow and getting to play before I have to go back to work. Seriously folks. 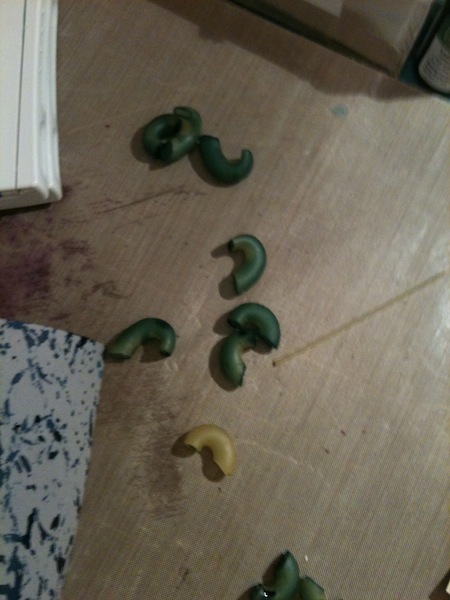 You just have to head on over to Shelly’s blog to see the results she had with the Macaroni Challenge. She did one in a video using short noodles and a Mellow Moss reinkers from Stampin’ Up! The finished card on her blog is using Perfect Plum and Shimmer Paint from Stampin’ Up! I found a website that lists, by month, the National Awareness Days. I had an opportunity to have a break in driving to do some searching for anything to spark some creative magic. I can’t participate but I can sure stir the pot. Doing the searching from my iPhone I’m going to lay the blame on the small screen and the small print. Saturday, April 21, 2012 is a celebration for the genius of Marconi who perfected radio transmissions. Ham Radio operators celebrate being able to yak the world over. I read the small print as MACaroni Awareness. Visions of children creating awesome flowers and trains, with macaroni, filled my head. This challenge is an EXPERIMENT. One of my favorite things to do. Find out what happens when you do…. My challenge to you, my friends, is to find out what happens when you apply ink products to macaroni and cast it upon card stock. Use a few pieces of Elbow macaroni dabbed in ink then apply it to paper. Spray some spaghetti, linguine, or other long pasta with your shimmer spritzes and toss the noodles on your paper. Arrange your noodles in a pattern of your choice and spritz your paper. Use the pasta as a mask. Wear a laytex glove, hold some shell pasta in your gloved hand. Apply several drops from a re-inker then toss the pasta on your card stock. The idea is to create a unique and one of a kind background paper. Use your newly created masterpiece on a card front, along with any stamped image you wish and create a greeting card. Use your background paper creation in a scrapbook layout. Accentuate your layout with photos and embellishment of your choice. 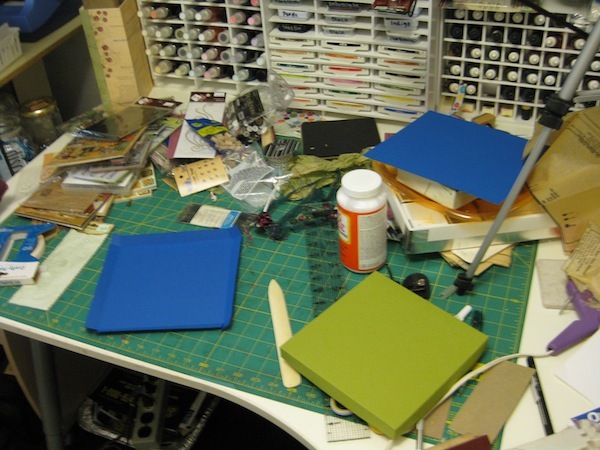 Use your background paper in an Art Journal or personal journal. If you are doing a 365 book add a piece of your work to a section in your book for April. Use your unique piece on an altered item. Whatever you choose to do take pictures of your macaroni masterpiece. 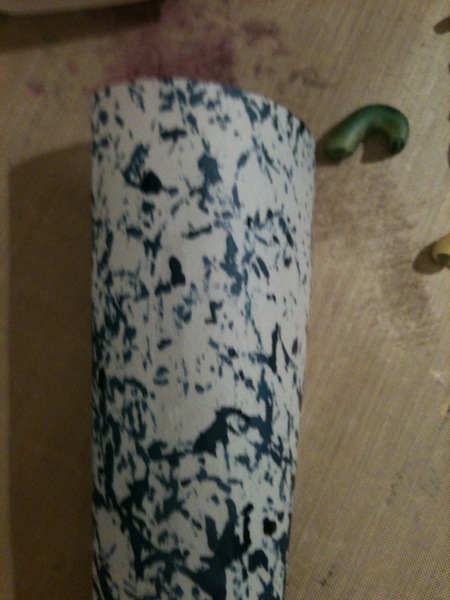 If you do create something with your AWESOME paper then take pictures of your finished work and add them to your blog. Tell everyone what you did to create your Macaroni Wonder on your blog and leave a link to it in the comments section of this blog post. Deadline is Saturday, April 21,2012. I will not be judging these. My only intent is for you guys to think outside the box in your crafting. See! That’s me thinking about crafting. Now for something totally different. An “Imagination Challenge”. 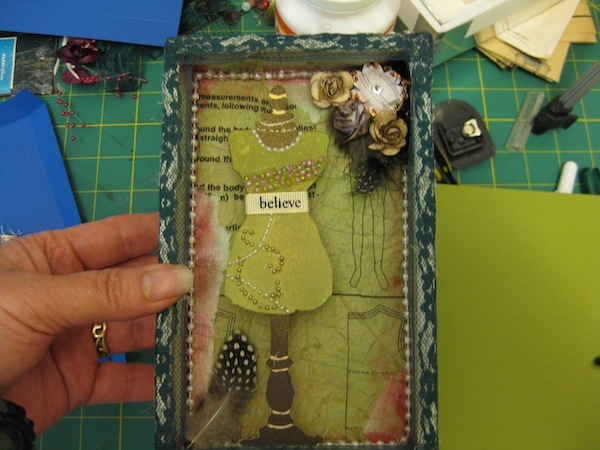 Create a card, journal page, scrapbook layout, or an altered object. 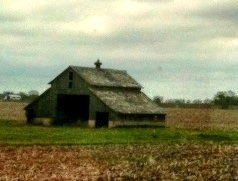 For inspiration consider the barns I took photos of while traveling through Illinois today with Joe delivering his trucks. Your inspiration can come from a feeling you get upon seeing the photos. A bit sad – How about an “I miss you” card? 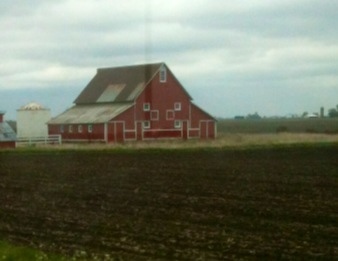 Did you grow up on a farm and have fond memories of the smell of hay stored away. 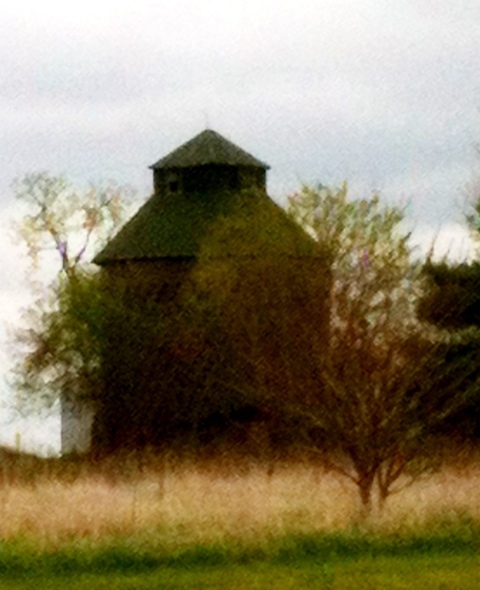 Did you play in the loft using the hay bales as your fort or a stage with an adoring audience at your feet? Do any of the photos spark a memory of long forgotten rubber stamps you had bought because you thought they would be good for your markers or Copics? 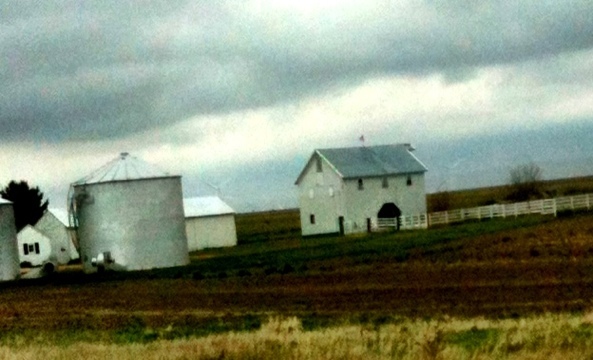 Do any of the barns make you think of a Christmas or winter scene? Even though spring is here and summer is close behind you can still do a winter scene. There is no time limit on this challenge. The only requirement is a write up on your blog about what inspired you and how you created your masterpiece. Leave a link to your blog entry here. One other thing. Have FUN creating your masterpiece. 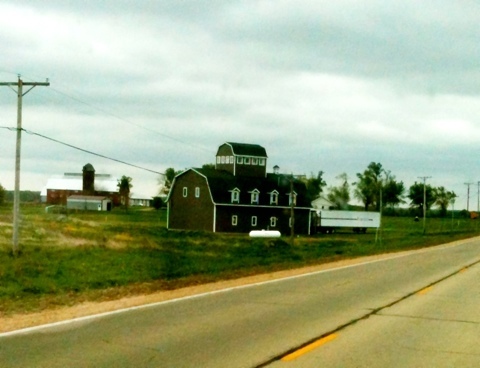 I got a call from Maureen this morning after I had posted my recent blog entry. She and I chatted for a while and got caught up on all the happenings in her world. Thank the Lord, all are well in her family. 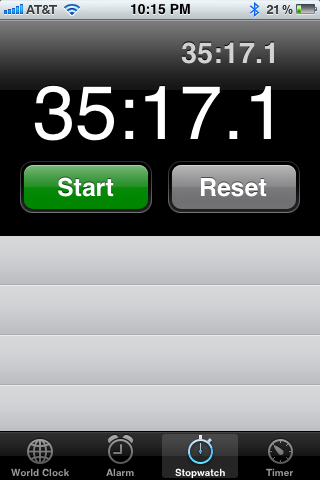 Maureen had asked me how long it takes me to pack for the road. I told her 30 minutes. What is there to pack for when there will be no fine dining, excursions to the theater, a night at the opera or art museum. So no dress up items get packed. They have hung in the closet for so long they have gathered dust. The only things I pack for are dirt, sweat, grease, mud, and the occasional three year old temper tantrum that I throw from time to time. In the heat of the summer I don’t wear makeup because the sweat turns me into a raccoon and my eyes sting and burn. I don’t use hairspray either for the same reason. 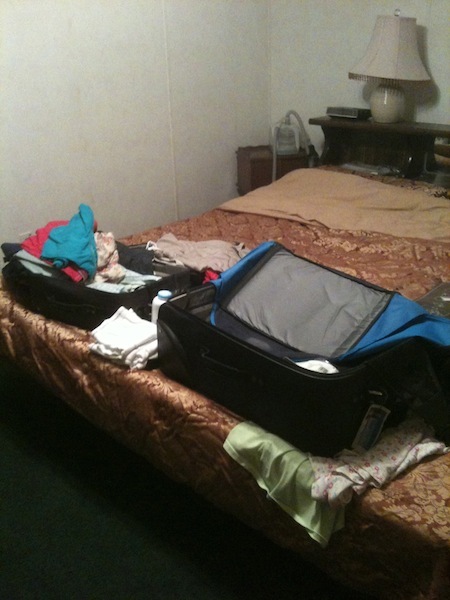 Living out of a suitcase for the last 11 years – yes even while I’m home I sort of live like in a hotel. Except my clothes are neatly folded and stacked on the dryer instead of being put away. Bad habit I’ve gotten into. 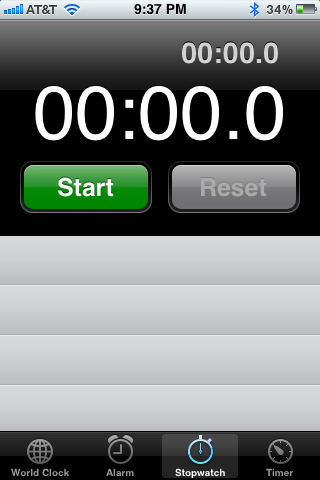 Just to see how long it does, in fact, take me to pack I set the timer on my cell phone. Two suitcases to pack. 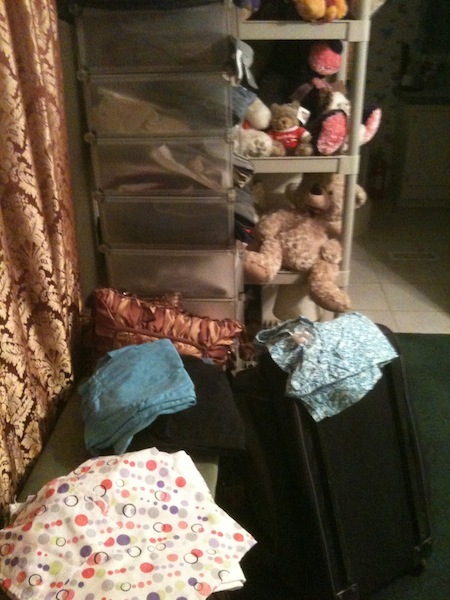 One is already mostly packed with Joe’s clothes since he recently came home. I just need to add extra clothes for each of us. A couple sets of outer wear and lots of under garments in one. I wear scrubs when I work. Keep the dirt and grease on those clothes then I don’t soil my street clothes and they can be worn an extra day. I’ve got Joe doing the same thing so he doesn’t ruin his clothes. Sorting and making piles of the clothing I will take that has been tucked away since last fall when we changed from shorts to long pants. Now for the stuff that STAYS packed all the time. My “truck bag”. 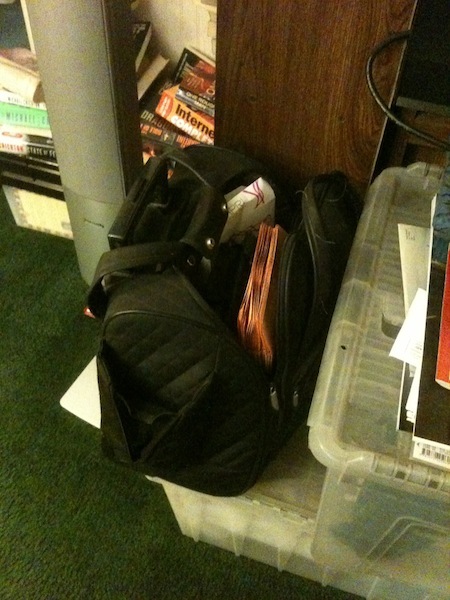 This bag holds all of my spare batteries for the radios Joe and I use to keep in contact with each other. I have a container of window cleaning wipes in there, and other items I use to display my legals in the window of the trucks I drive. This stuff remains in this bag and does not come out. 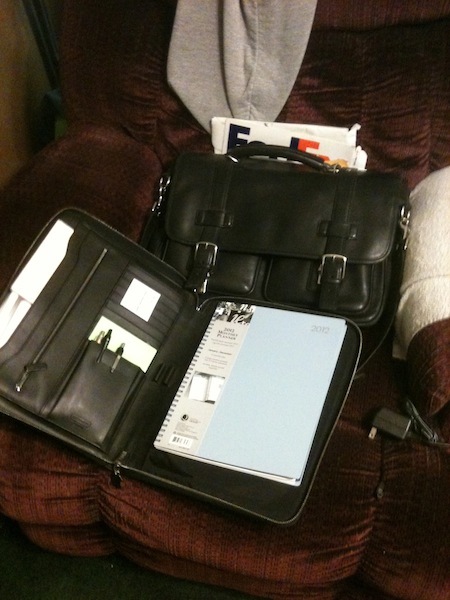 My “day book” and “saddle bag” that Joe likes to call it. This is my office while on the road. Log books to keep track of the time we drive and all rest stops we take. Have to keep the DOT happy. I also have a monthly calendar to keep track of all the hotels we stay in for our tax *groan* information. I also keep track of where we pick up and where we deliver. At the end of the year that calendar is tucked in the bin along with all the other tax documents. Paperwork YUCK. I’m not even going to talk about that right now. Next is my “Face Bag” which doesn’t hold much for my face in there. 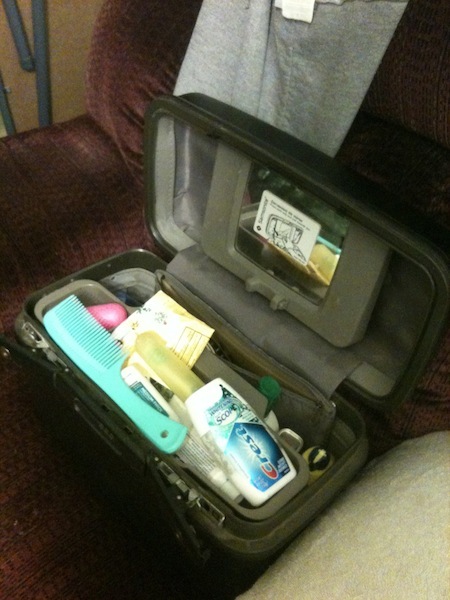 Comb, deodorant, toothpaste, tooth brush, sun screen, antacids, and the most important part of the whole thing….my traveling First Aid Kit. Band-Aids, ointments, creams, disinfectants, and other assorted items because Joe loves to come to me bleeding from some place on his body. Mainly his big toes. 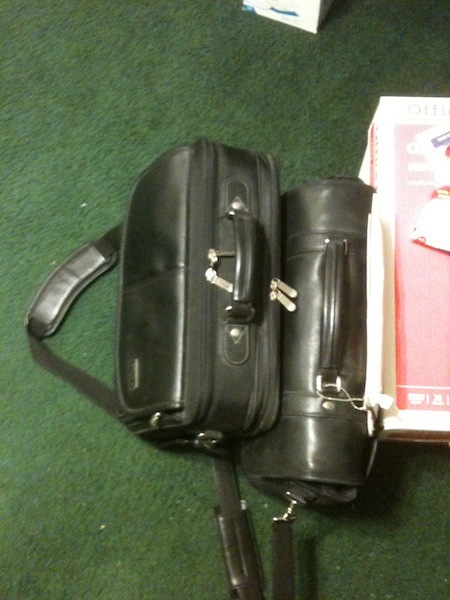 My two “Office” bags together. One has my laptop and the other has my day book and other things. My “Legals” for the different companies we drive for. I have to keep them with me at all times – whether home or on the road they have to stay with me. And of course, my GPS that is instrumental in keeping me going in the right direction since I am totally “directionally challenged”. Now, in my opinion, this is the most important bag I make sure to take with me at all times. 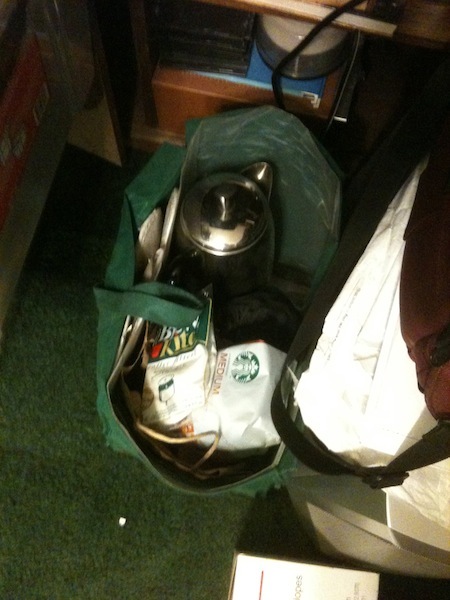 My “Coffee Bag”. HAVE to take this along. Nothing better than fresh perked coffee first thing in the morning. 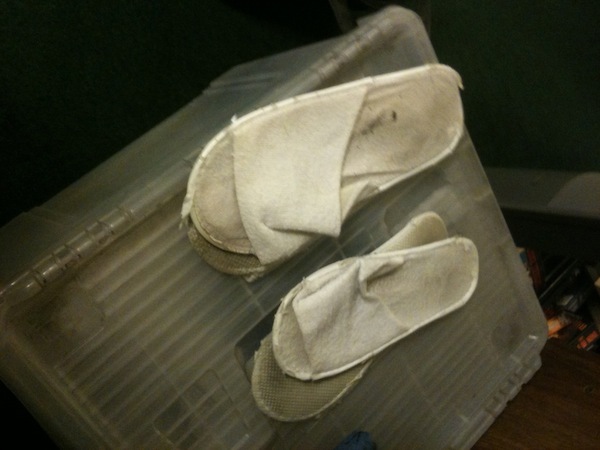 Our hotel shoes were getting quite scruffy since the last time I was out with Joe. Time to put these in the trash and get some new ones from the plastic bin below. That’s done. The two plastic bins have been sorted and are replenished with brown envelopes and checked for necessary extra quantities of bath soap, Q-tips, shampoo, and other personal hygiene products. Since most everything has been left in the bags, cases, and bins the suitcases were the only things I had to really check through and pack. I’ve got laundry soap and fabric softener sheets in the back of the pickup, extra scrubs in other bins, spare work gloves, light and heavy jackets since we never know what the temperatures will be when we arrive. Life out of a suitcase. Good and bad of it all is right here in my home. Okay, starting tomorrow my next posts will be on my “Foolishness and Mayhem” blog. The adventures begin. My time at home is over. We’ve had to take our work pickup to the repair shop for some maintenance. The cost this time was more than we expected. The front brakes were bad, calipers (whatever those are) were bad, some kind of rod or piece was about to break off and leave us stranded on the road, and the front end needed to be aligned. The water pump sprung a leak on Joe before he headed for home last week. We are now in the hole and it is time for me to get out there and earn money to get us back into a better financial status. Since this is my last day at home I’m making the best of it in my craft room. It is a terrible mess right now but I’ve promised myself that it will be cleaned up before I go to bed tonight. Joe has two trucks out of Dallas at Steven’s Transport. There are two men there that have been very helpful to us. Joe calls to let them know when we will be arriving and they have the trucks ready for us and waiting. When there is a problem these two guys stop what they are doing and come to take care of us. In appreciation for their help I have made them Post-It-Note holders as my way of thanking them. The first one is for a man named Art. He is a Marine and a Native American of the Apache clan. I searched the internet for a photo of anything that would be strictly Apache and I found some really old photos of Apache chiefs. I downloaded and printed one of the photos off and adhered it to the base of the holder. 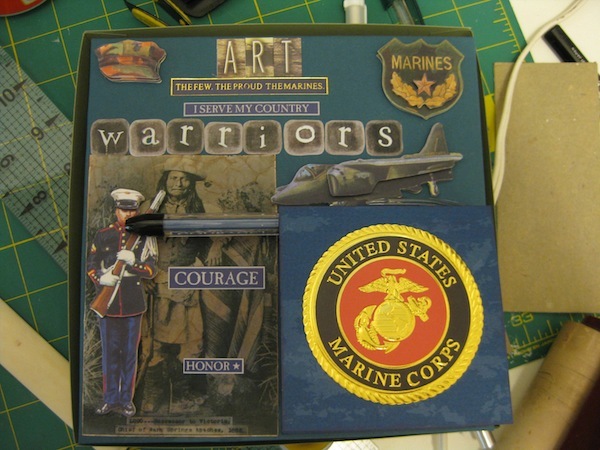 Then I added several things Marine related. The stickers are from K&Company. Several of the stickers are layered and raised to look 3D. Here is my creation. The next one is for a man named Cherry. He and his wife have purchased a home and he is remodeling it. When I asked him what kinds of things he was interested in he told me he loves building things. Then he told me about the work he is doing on their home. The stickers I’ve used are from Creative Imaginations and Jolee. I had to get Joe’s opinion on this one. I thought I had it way to busy. Joe is happy with it so I guess it is good. I’ve also been working on the faux “Configuration Box” I made from Foam Core. 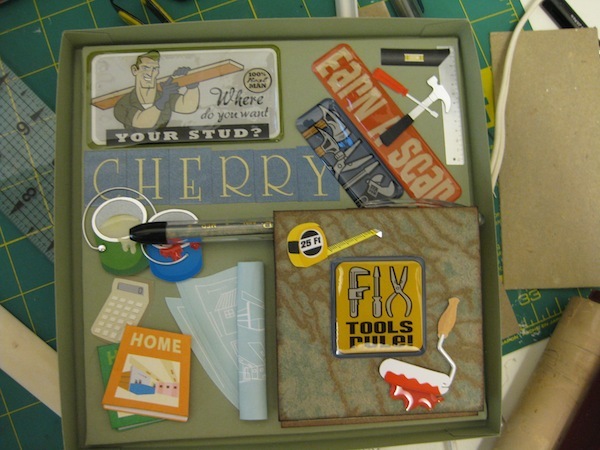 I covered the larger box with paper from Stampin’ Up! I purchased last winter. The sewing themed paper. 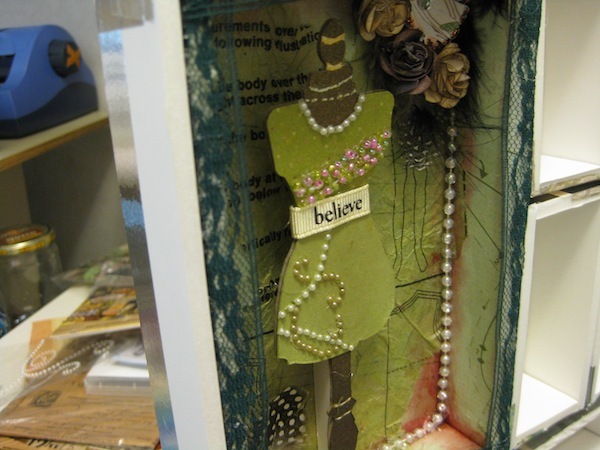 I’ve used a die from Tim Holtz – the dress form – and some of my scraps of paper to create the dress. I spent quite a lot of time adhering seed beads to the top of the dress. My finger tips have burn spots from using the hot glue gun. After a while I gave up on that and used a couple of the half back pearl swirls and flourishes to give my fingers a bit of a break. To cover up a few spots where the paper inside didn’t actually meet and cover the Foam Core I added some clear beads that are strung together and on a spool. These were adhered with hot glue inside the box. The lace on the outer rim of the box is hemming lace. That was adhered with hot glue. I’ve added a “belt” to the dress from some word ribbon I have had forever. That also was adhered with hot glue. Up in the top right corner I have a really huge gap in the paper and the Foam Core. There I’ve adhered a feather and some of the flowers I made earlier in February or January. I had to take a look at this in the box to see what it would look like. Pretty good too and I’m pretty pleased with how this is coming together. The dress form I’ve attached to a scrap piece of Foam Core and then attached it all to the back of the box so it will stand out away from the back. I’m going to be putting three 1/2″ thread spools in the left bottom corner where the feather now lives. 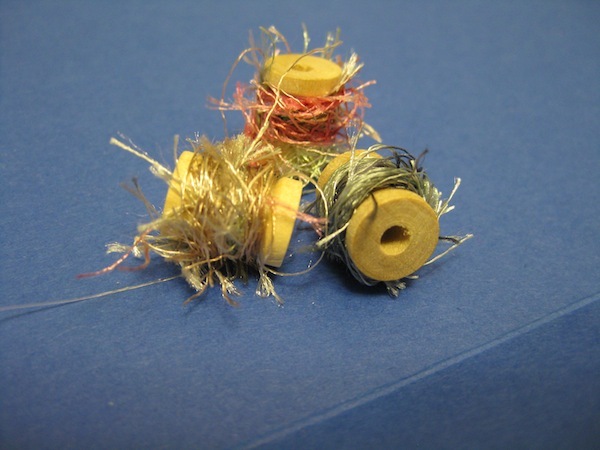 I have a lot of eyelash yarn and I’ve wound some of each color on the spools to make it – sort of – look like thread. These spools I purchased from Hobby Lobby. There are 24 in a bag for $1.47 and they are all wood. 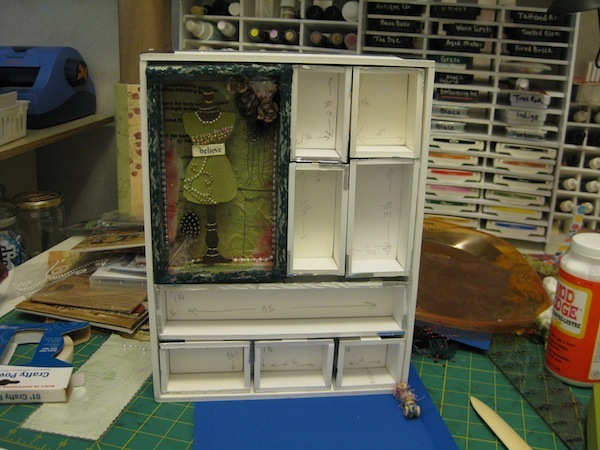 I need to get back in my room and finish the boxes I’ve created for the Post-It-Note holders. Make a belly band for the boxes and make my “MIAF” logo button things. Then I’ll work a little longer on my faux configuration box. See how far I will get before I have to shut it all down and clean up this mess. There is a possibility that I will be able to play again in a couple weeks, but that is not set in stone right now. My next posts will be on my other blog – Foolishness and Mayhem. I’m off to my room to get creative while I still can.